The time has come and gone and we’ve officially said goodbye to 2016 on The Kenai, Alaska’s Playground. From season to season we were absolutely spoiled last year with the most epic displays of raw nature, adorable wildlife, magical mountains and glistening glacier views. We enjoyed every second of our peaceful ‘off season’ months and welcomed visitors from all around the world with arms wide open during the summer months. Here is a collection of some of our most memorable moments from the year as shared through the eyes and camera lenses of our loyal, loving fans and followers. With that being said, we are ready to make 2017 better than ever and can’t wait to share the journey with all of you, every step of the way. Wishing all of our friends out there a safe and Happy New Year! 1 – We started January off with this incredible photo of a sow and her cub enjoying some private time on the beach at Naknek Lake in Katmai National Park. It’s impossible not to fall in love with that adorable baby face staring right at you! 2 – February brought us so much more than just sweet nothings during Valentines Day. This phenomenal aerial view overlooking Cooper Landing left us utterly breathless. That turquoise blue color was enough certainly eye-candy to get us through the rest of the winter. 3 – When late February rolled around and we got a glimpse of this adorable photo of two young girls eating breakfast while a moose peeked inside, our hearts about exploded. This is pure joy and happiness in a single photo. 4 – When March finally rolled around after a long winter, everyone fell in love with this iconic sign. To us, this represents a one-way ticket to the very best place to be in all of the Last Frontier! PC: Prentis T. (Tom) Keener, Jr.
5 – Late March spoiled us with this enchanting nighttime view overlooking the Homer Spit. We are so enchanted by the way that the lights reflect into the shores of Kachemak Bay and the way that the mountains jolt up into the air thousands of feet above sea level. 6 – A foggy April evening in Homer turned into a very alluring photo shoot when the clouds covered the low ceiling with bits of the sun sporadically peaking through. 7 – One of the most magical moments in May came when a full moon was spotted at sunrise overtop of a fishing vessel in Kachemak Bay out of Homer, Alaska. Again with that spectacular reflection! 8 – June is always a special month on The Kenai because it marks the official start of summer. This photo of a few happy outdoorsmen floating the upper Kenai River definitely gave us fishing fever! 9 – When the fireweed was in full bloom in July, we were at a complete loss for words. I mean c’mon now! This is one of the most incredible sights in the entire world. The mountains in the background add a lovely dimension to the overall setting as well. 10 – This August photo of two moose smooching shared by Summit Lake Lodge in Moose Pass made us almost explode with happiness. These wild creatures are simply stunning when observed in their natural element. 11 – When September rolled around, this rare photo of the Alaska Railroad, a boat pulling a fishing boat and a black bear lounging in a tree had us screaming with amazement. This just might be the most ‘only in Alaska’ moment of the year. Incredible! 12 – Not only did October spoil us with stunning views of fall foliage, but this picture-perfect shot of a bull moose jumping across a chain length fence to join the other neighborhood moose was completely jaw-dropping. Talk about being in the right place at the right time! 13 – Summertime might be when the rest of the world prefers to visit Alaska’s Playground, but we think the winter months are our best kept secret. This winter wonderland shot overlooking the Kenai River at the Russian River Confluence in Cooper Landing is our proof of that. 14 – The cutest (and most ‘liked’) picture from November came when these two absolutely adorable reindeer baby reindeer came trotting across our computer screen. It is impossible to deny that this picture is the cutest thing you’ve seen all winter! 15 – We couldn’t get enough of this adorable spring bear cub after he got all muddy playing with his two siblings in the tidal flats of Cook Inlet. Is your heart melting? Ours is too! 16 – Last but FAR from least is this majestic photo from our neighbors in the southeast Alaska town of Ketchikan. Sunsets like this are truly a force to be reckoned with. Wishing all of your friends, fans and followers a safe and happy 2017! 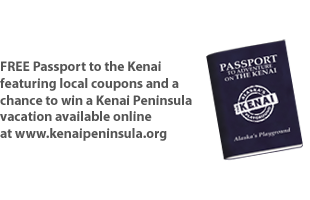 Be sure to put a visit to The Kenai, Alaska’s Playground at the tippy top of your bucket list this year. We know you won’t regret it!